Tennis elbow is most often the result of repetitive activities involving the wrist and/or hand. Excessive use of the wrist/hand can lead to increased stress on the muscles of the forearm. This causes damage to the muscle tendon. Since many muscles of the forearm come from just above the elbow, small tears of the muscle tendon are felt as pain on the outside of the elbow. The resulting pain and discomfort may be felt with everyday activities such as carrying groceries or lifting a jug of milk. The pain may also restrict various work-related tasks and hobbies. Grip strength is often much weaker on the painful side. As the name suggests, tennis elbow can also result from playing racquet sports. As the racquet follows-through after hitting the ball, muscles of the back of the forearm work hard trying to slow the racquet down. Over time this can result in damage to the tendons and pain at the elbow. Tennis elbow treatment includes physiotherapy as a key component. Registered massage therapy aims to relax stressed muscles. A proper stretching program ensures that muscles are the correct length. Deep friction massage is also often used to break up scar tissue at the elbow. Tennis elbow treatment can include ultrasound and other electric modalities to reduce inflammation and pain. Acupuncture may be used as a treatment option for Tennis elbow. All of these tennis elbow treatments act to speed up healing time. Despite the small size of the forearm muscles, strength training is important. This helps build up muscle resistance and prevent re-injury. 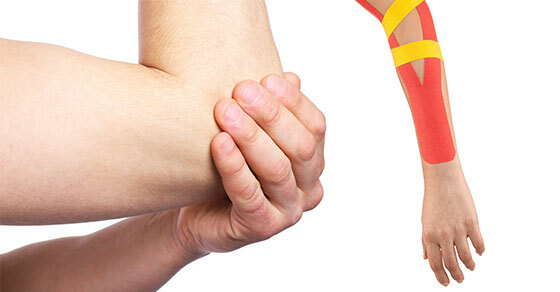 Therapeutic forearm bands and taping by physiotherapy professionals can also help to unload sore muscles and relieve pain. This allows a fast return to everyday activities. A full physiotherapy assessment also allows us to rule out more serious problems such as fractures, torn ligaments and nerve damage. Should you be experiencing elbow pain at any point during your everyday activities, contact our team now to arrange a physiotherapy assessment and let us put you on the road to recovery! Tennis elbow treatment can be fairly quick. Pain can be reduced rapidly with the proper tennis elbow treatment.